The rating of Running Man latest episode went down to single digit (9.8% AGB). The ratings have been low recently and it boils down to certain factors contributing to low ratings which i am going to talk about later. Actually, all variety shows or drama have some good episodes in a mixture of average or bad episodes. Most of the times, these were based on our own preference and opinion. As an avid fan of Running Man since it started airing in year 2010, I do have my own set of opinion on why is there a decline in ratings recently. Despite the fact that there are new variety programmes showing in Korea such as Real Man and challenge from old competitor 1N2D, I believe Running Man can stand on their own with some fine-tuning. It now depends on the Running Man team readiness for challenges ahead of them. Running Man is the long standing urban action variety programme in SBS now; hopefully they can continue to entertain us for as long as possible. The variety world is ever changing and will always be vibrant with new energy added into the entertainment world. Some of the competition came from new and refreshing variety programme such as Real man and Star Family Show Mama Mia, definitely it has attracted viewers to watch out of curiously. Appa Odiga is also a cute variety show featuring adoraable kids and Sunday is a family day, I supposed some viewers prefer cute stuffs. These variety shows were still experimenting what works and what does not work. Just like Running Man in its initial stage whereby many things still need to figure out and they learn along the way. Somehow, Running Man has reached the brim of the bottle and their ideas were running out. The other variety shows such as Bare foot friends is following their footsteps and adding more energy to it as compared to Running Man. That is not to be blamed after all, since Running Man has been airing for so long, they have reached the peak and is going downhill now. ﻿Running Man cast knows about their roles and characters in the variety show. Therefore, they act and behave certain way during the show. Sometimes, the Running Man are confined by the story lines and the theme so they have to 'act' according to the script. Yes, their acting makes the show unnatural and 'forced' to some extend but they still need to play the characters. For instance: the Monday Couple. This is part of their characters in the show and audiences like to see them together. However, there were times when people 'over do' or became overboard with their actions. One example is Lee Kwang Soo and I am not a hater, should you jumped up and get worked up by this comment. I actually find Lee Kwang Soo funny and enjoyable to watch except for those moments when he 'bullies' Kim Jong Kook. Once in a while, it can be entertaining and fun but not in every episode. It became a predictable cycle every week and it gets tiresome and annoying to watch after some time. Other than that, fans were tired of watching the same people paired up again. Every week is always Monday couple, dumb and dumber, Tiger-giraffe and easy brothers. The Running Man established its characters early in the show and have been playing that role ever since, audience want some changes and surprise. Not the same antics and jokes repeated many times. Some of the games were 'reused' and 'recycle' which make the games predictable and gave advantage to someone who is good in that game. The same format goes to Yoo Jae Suk who will always team up with guests and will win the game eventually. Why would people want to watch if every time they can predict who is the winner? I do not know why Kim Jong Kook has apparently become weaker than his Spartakook image. I think it was after his injury, his character in the show was not a prominent as before. However, he did attempted to make a comeback as 'The Commander" with the recent episodes. Sometime i wondered is it that the PDs ask him to lessen that image, the cast getting stronger or simply he does not want to be the fearsome commander anymore? His motivation and competitiveness were often hindered by the Running Man cast who often gang up on him. There is a saying," a group of hyenas can kill a lion." After getting betrayed a number of times, perhaps Kim Jong kook has lost the drive to win. 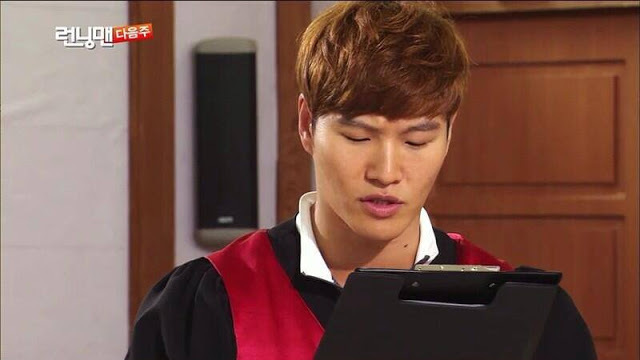 Kim Jong Kook does not need to portray a commander image every time, for example the soccer special episode with Park Ji Sung, where he got this nickname "kim leave it" after he underperformed. I admitted that it was fun to see the almighty commander failed once in a while. However, he still needs to portray his strong image during games to make it more exciting. Just like during the early episodes, we all know Kim Jong Kook used his strength and strategies to win, the mission team being the underdog will try their best to outsmart the Chasing team in their own ways. On the other hand, Ji Suk Jin did his best although he is the weakest. I like his recent motivation to do well and prove that he is not that weak. Most of the time, he ended up looking miserable and funny but at least he make some changes to his original character. Running Man giving in to guests? There are people who complained that Running Man gives in to guests, especially idol groups. While I would not say that Running Man purposely let the guest win, but I am sure they did compromise and go easy on the guests. The most obvious is episode 145 and episode 156 of Running Man. Unfair? Sure, but they have to give in to guests to a certain extend and I am not surprise should they determined the winner beforehand. We will never know how much the variety show is scripted as long as we are not working there. Nonetheless, Running Man is about cheating/ betrayal every now and then so just take it as entertainment. There are always flaws in any programme and we can't blame the Running Man team for the entire mistake. After all. they flimed the show for a long time but edited it to fit into a one hour-thirty minutes programme. The entire team makes a lot of effort to source for resources, locations and think of new ideas. Indeed, the Running Man can do better in terms of editing. Being a long running variety programme has a major problem on its own and that is to create more innovative games with whatever they have. They have been there and done that so what else are there which the Running Man have yet to do? Many a times, Running Man recycled the same concept for the games which they deem as fun and popular. I know Running Man team will fit in some games according to the theme which they are doing. However, having seen the same format of games repeating in front of my eyes for a few times, i was like, "Again?" For example, the ttakji game, village game and jumping on the rough mat game which started out good until they reuse it again within 10 episodes. I think the early episodes of Running Man focused on teamwork and leadership from the two leaders - Yoo Jae Suk and Kim Jong Kook. However, somewhere along the way, the Running Man team started to think for themselves only. Their motto is not to trust anyone and betraying is the only way to win a game. I don't know if I am the only one that feel that the Running Man are not as united as before? Yes, they are a family and their characters have developed more in-depth. But where is the teamwork? Especially in episode 150 of Running Man, they lost because of this reason. I wish they will be more motivated to win in a team then followed by individual wins. To get back on track again, perhaps the Running Man team can consider watching some of the old episodes while thinking of new ideas. I understand that Running Man is in the midst of finding and creating new concept nowadays but those were the golden era of Running Man which make it what it is today. What do you think? This was the survivor episode whereby Running Man cast have to vote a member out and eliminate this person once the mission begins. This episode is really exciting and fun especially the first part where the prey became the predator. It was hilarious when HaHa said;" The first part is not a variety." I think they really went all out to survive in the game. This was one of the most spectacular episodes in Running Man history. Spartace work perfectly well to catch the other members in this 2 vs 8 game. One act as the eye and the other does the catching. This was the first episode which the Running Man cast has to look for the guests. TVXQ were pretty good in the hide and seek game and it gets very exciting whenever the Running Man is near the guests. Without any clue, the Running Man cast has to be observant and fast in chasing the guests. I also like to see the Running Man working together hand in hand to pass the challenge; otherwise, they have to go through punishment. Honestly, I missed those golden days. This was the first time the Running Man team explores with a spy theme. Kim Hyun Joong has to eliminate all the Running Man cast with the help of HaHa. 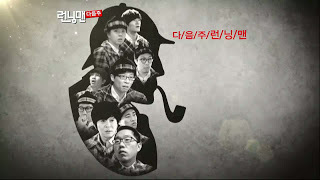 I was really amazed that HaHa is so clever and cunning to trick his fellow Running Man members. Kim Hyun Joong did very well in this episode too. This was the episode when they first filmed in a train station. They will try their best to gain the Running ball, or else they have to accept the punishment (example, wearing hot pants at the public in a cold weather). I like the way the chasing team will go after the mission team in order to win the Running Ball. The bells hanging on their ankle is very scary when they give chase to the Mission team. Kim Jong Kook and the two kids were pretty much the highlight of the programme. I love to see the shocked and frightened expression of the mission team and those moments were genuine. This was the first episode whereby the Running Man explores with the theme on Supernatural power during Christmas season. Many people agreed with me that this was one of the best episodes of Running Man. Why? Because the supernatural power is hilarious and the way they used it was brilliant. This was the first time ever Kim Jong Kook gets eliminated first. People likes to have a twist to an otherwise expected ending; therefore viewers find this episode refreshing and different from the rest of the episodes. This was an awesome episode and i highly recommend this if you miss it. Initially, all the Running Man was arrested because of some 'crimes' that they had committed. Then they were send to the jail and after that they have to figure out how to break the jail with the hints given. But that is not all, because Yoo Jae Suk was actually a spy and his task is to shoot the Running Man nametag using the water gun. It was so funny when Yoo Jae Suk hesitated every time he has the chance to eliminate the Running Man members. The highlight of this episode is when Kim Jong Kook breaks out of the jail twice! Gary is his usual carefree self who does not bother to find the clue to break free from the prison. lol. This was the first time Ji Suk Jin plan a scheme to eliminate all the Running Man members and guests. Actually, i can say that the plan is brilliant and i did not know what is going on until towards the end, then i know who the culprit is. Spartace as usual cooperated very well, although i really hope Ji Suk Jin plan work after all. It was funny how the Running Man plotted to play a prank on Gary. Is Gary the innocent and gullible guy we see onscreen or is he more than meets the eyes? We do not know actually who gets fooled, but i must say that the process of playing a joke on Gary was plain fun. There was some suspense in this episode and i suspected something is fishy during the School trip. Gary is so brilliant here, as the mastermind zombie who planned all the attack on his classmates. It was scary because of the theme and it is definitely one of my favorite episodes of all times. I like JYP as a guest and he showed his wits and competitiveness during the programme. This dude looks like he is game for anything and is not afraid to make a fool of himself in front of the camera. Gong Hyo Jin surprised me when she was so participative during the games. She shows that she is not a damsel in distress when she protected Lee Kwang Soo, this lady can stand on her own ground. This was the Idol Versus Running Man challenge and i simply love to see how they can go against each other. It is like Youth Versus Experience. I like to see the competitive Yong Hwa, Nichkhun and Min-ho versus the Running Man especially Spartakook. Lee Joon expressions when he met Kim Jong Kook at a dead end in both episodes were classic. Bring them back and make merry! Jackie Chan is hilarious and funny during this special episode. He is like a neighborhood uncle that looks so friendly and approachable. I also like Choi Si Won because he is the 'power brother' with Kim Jong Kook. Haha. Cha In Pyo looks like a serious person but he can be really fun-loving too. His aerobic dance was super hilarious and his pose look so cool but he did not manage to flip the ttakji. Lol. Both Goo Soo and Han Hyo Joo were funny and entertaining to watch. Han Hyo Joo even volunteers to perm her hair during this episode. I like their participation during the games. These baseball players were so fun and entertaining. I like their smiles and their sportsmanship. They were competitive and fun at the same time. The other examples are Patrice Erva and Koo Ja Cheol. Choi Min Soo, Chu Sung Hoo and Kim Dong Hyun project a frightening image. However, among these three people, I am afraid of Choi Min Soo the most. He does a sudden attack and disappears the next moment. His movement is swift and agile despite his age and that is admirable. With him around, it is like playing with a lion. 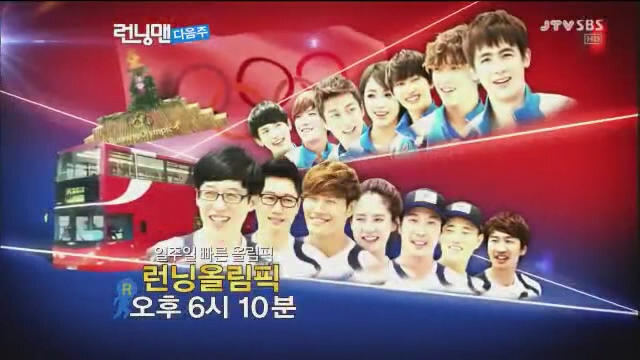 With these guests, Running Man will be very exciting. They appear to be nice and friendly in this episode. Son Yeon Jae has a really sweet smile and Park Tae Hwan is very sporty and fun. The most important thing is that they leave a great impression. Kwang Soo the Asian Prince? Haha. He is really popular in Asia. I like the games played during these oversea trips. Lee Dong Wook and Han Hye Jin were nice guests too. This was a fun episode and Big Bang was hilarious. Although it may not be the best episode, but they did put in effort and participated just like 2NE1. Noh Sa Yeon is really entertaining and funny whenever she appears in Running Man. She is able to take jokes and sometimes she even laugh at herself. She is indeed a fun person to guest in Running Man. you are absolutely right!!! on everything! as for me i always love to see mud fighting and water or pool fight... It always have extreme laughter in it. Im kinda dissapounted because the latest episodes did not have much of it.